Most Long Island soils harbor viable seeds from their arrival via wind, birds, or mammals years to decades ago. Under the right circumstances — exposure to sunlight being one — these seeds (possibly noxious weeds or more ivy) will quickly germinate and grow. Oriental Bittersweet: The vine of this species can eventually grow large enough to aggressively entwine trees and other plants. The roots are bright orange; flowers small and greenish-yellow; and fruits are pea-sized capsules that change to bright yellow and split open when ripe, revealing a bright orange-red berry within. 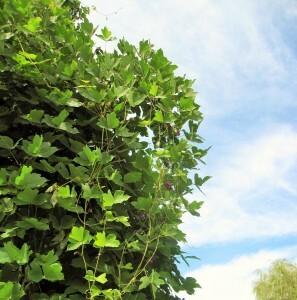 Cut large vines at the ground and dig or pull out small roots. Click Vine Removal for details. 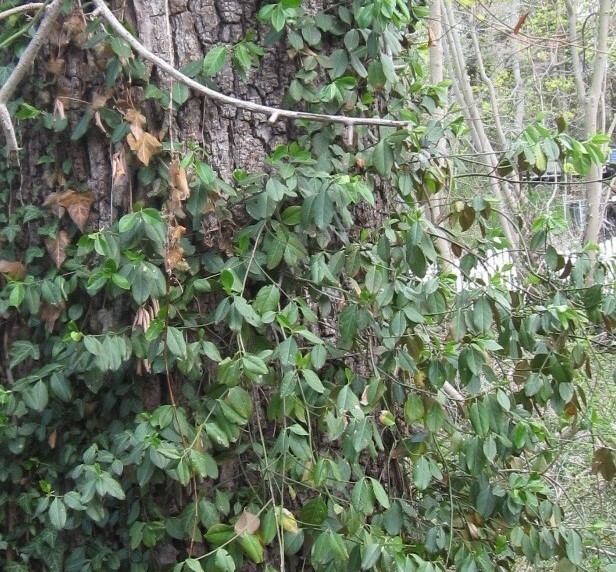 Winter Creeper: Also known as creeping euonymus, in winter this evergreen vine produces a four-lobed pale green pod-like berry, which splits open to reveal the fleshy-coated orange seeds, one seed in each lobe. 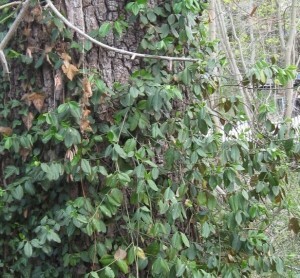 It often grows along with English ivy and should be removed in the same manner. Click Vine Removal for details. 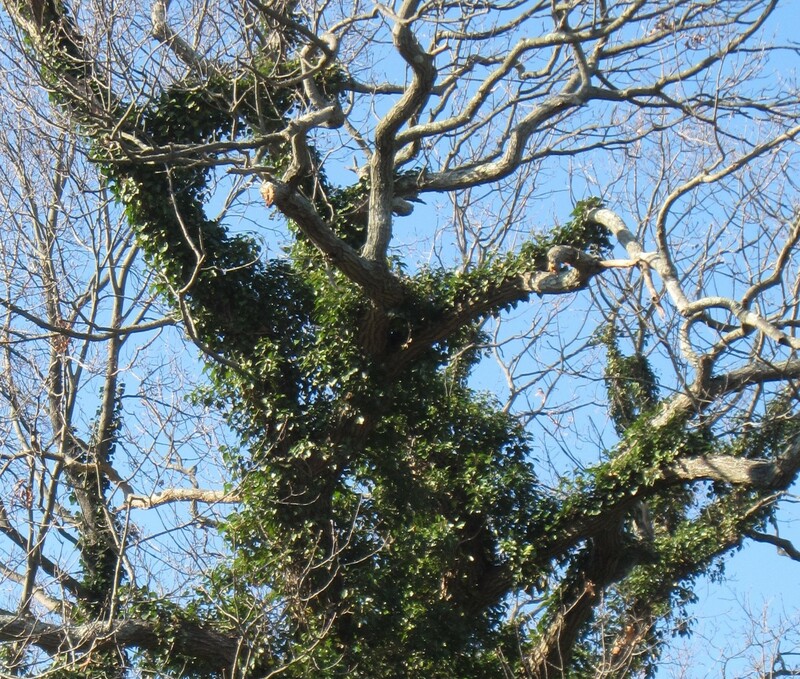 English or Common Ivy: An infested tree will exhibit decline for several to many years before it dies; and the added weight of vines makes trees susceptible to blowing over during storms. Cut vines at the foot of the tree and pull them from the ground for at least 2 feet around the tree. Gathered vines can be piled up and flipped semi-monthly until they desiccate..
Japanese Wisteria: Beautiful lavender flowers distinguish this vine, and is the reason this exotic species was brought to our shores nearly two centuries ago. Cut and pull the vines and roots from the ground to effectively remove this plant. 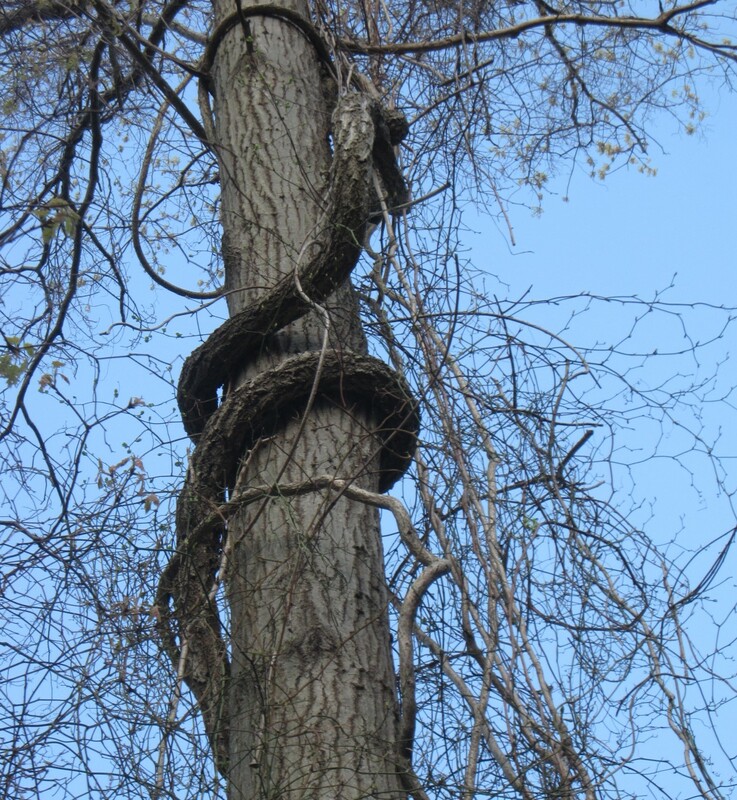 The twined vines should also be cut from the the trunk. Because this is a difficult plant to control, all of the plant material should be removed and discarded, as even the cut vines can set roots and regrow. 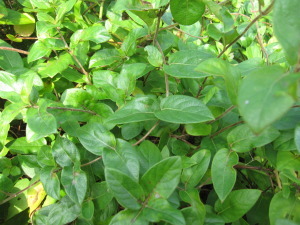 Honeysuckle: Several non-native species of this plant include shrubs and vines; may produce red or black berries; and have yellow, pink or red tubular flowers. Common traits: hollow pith stems, opposite, oval leaves with smooth margins (leaf edges). The roots grow laterally just below the surface of the ground. Pull out all parts of the root to effectively control the plant. Revisit site every few weeks during the growing season to remove new growth from any remaining roots or seeds. 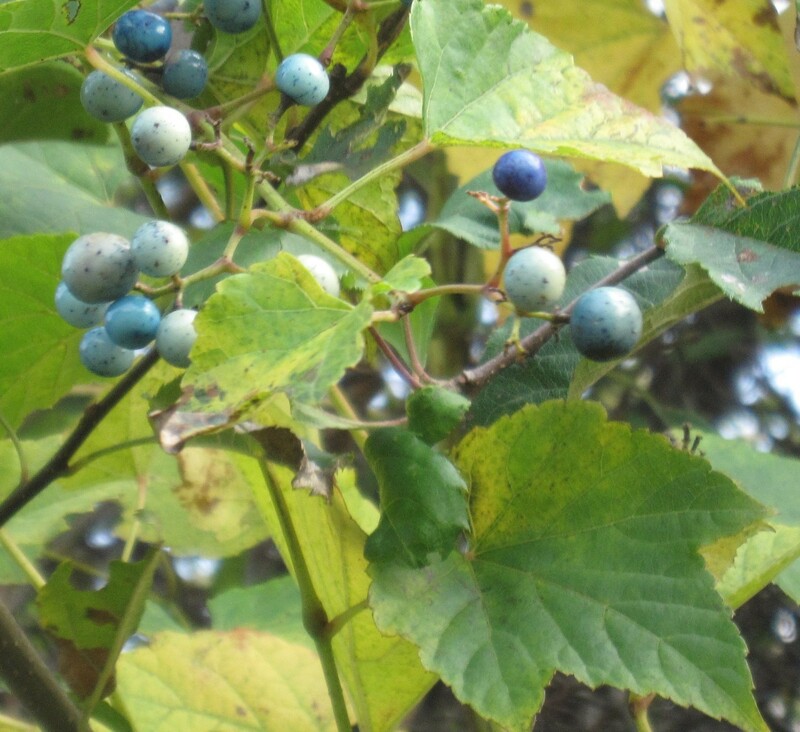 Porcelain Berry: Similar in appearance to wild grape–even with tendrils–except that the pith (center of the vine) of porcelain berry is solid white; mature bark does not peel; berry colors include white, yellow, lilac, turquoise, green and pink, eventually turning dark blue; and leaves are generally small with deep lobes. Remove and dispose of the entire root (often many feet long) and berries. Check on regrowth semi-monthly and remove suckers and seedlings as they occur. Mile-a-Minute: Leaves of these thread-like vines grow quickly to cover and obscure sunlight from shrubs and young trees, interrupting plant photosynthesis. Because this weed is an annual the root will not generate new growth. However the seeds are prolific. Remove the barb-bearing vines (be sure to wear thick gloves and long sleeves) in early August, just prior to flowering; bag, and allow to cook in full sun. 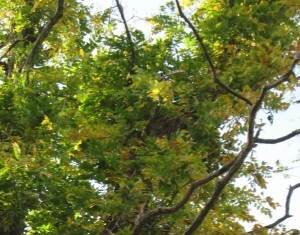 Revisit the site annually to check for new growth. 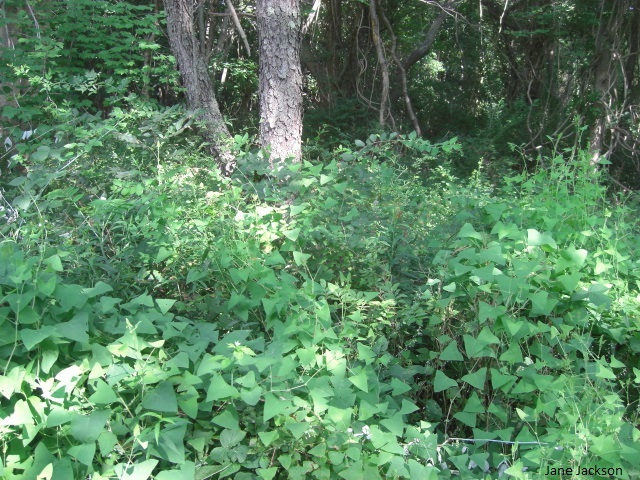 Kudzu, aka The Vine That Ate the South: KUDZU AND GIANT HOGWEED HOTLINE: Residents should take photographs of suspect kudzu or giant hogweed plants and email them to ghogweed@dec.ny.gov . You can also call 845-256-3111 to report. Poison Ivy: Most people recognize the three leaves of poison ivy. If you need a reminder, google search the name with “images” to see hundreds of photos. This picture was taken of the vine in winter without leaves. 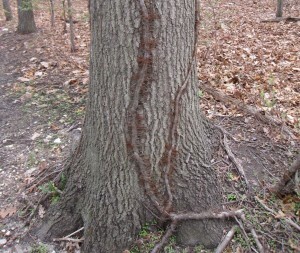 Here you’ll see the root hairs that attach to the tree. 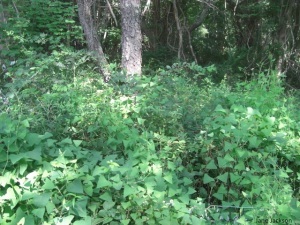 If allergic to the leaves of poison ivy you’ll want to protect yourself from the vines as well. 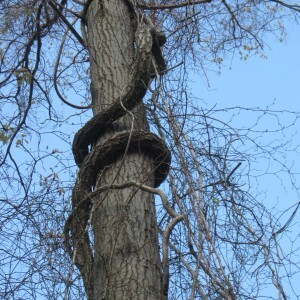 Notice that the vine in this photo is starting to encircle the foot of the tree. Cut, remove and dispose of this portion, and extract as much of the root as possible. Keep in mind that poison ivy is native to Long Island, and unless it is creating a health risk leave it for wildlife to enjoy.